This is Part I in a series of articles on Electronic Locks. These locks work in conjunction with an access control security system, allowing you to do away with old school keys when unlocking your door. What is an Electric Strike? How does an Electric Strike Work? An electric strike modifies the existing strike on your door frame, allowing your door to be unlocked via electronic means instead a physical key. This way, your door can remain locked to public access, while authorized users can access your space easily without manually turning the latch. Here's an illustration below. The strike cavity refers to the hole in the door frame where the door latch fits. On the perimeter of the cavity is a keeper, where the deadlatch rests when the door is closed. On a normal strike, the latch will have to turn and contract back into the door lock before you can swing the door open. However, an electric strike modifies your strike so that the latch does not have to turn at all. Instead, a modification is made on the keeper, allow it to pivot outwards when an unlock is activated electronically. Think of it as creating a lid on your door frame that is powered by electricity. Why use an electric strike? Most electric strike models are tested up to 500, 000 cycles, where they can withstand traffic involved with access control applications. Therefore, electric strikes are used as parts of many electronic access control systems to provide added security and convenience for traffic control and offices with high turnover rate. Most electric strikes can be made to accommodate odd frame conditions and other problems, hence they are a versatile fit for most doors that need an upgraded level of security. 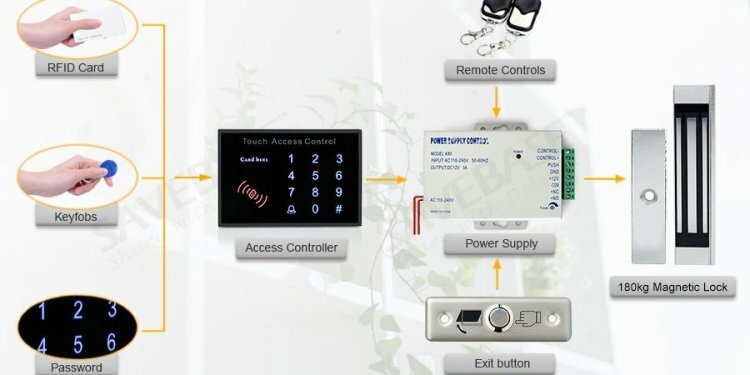 Electric Strikes are almost always installed with a physical security access control system, which requires some form of authentication for users to enter. They usually come with a buzzer, a keypad, a key card, or a key fob reader. How much power is required for an electric strike? Electric strikes are one of the most common type of electronic locks for office and residential buildings; there are many calibrations and variations of electric strikes, but most of them are easily powered by a small voltage of either 12V or 24V. This means that a regular US-standard wall socket with an output of 110-120V can sufficiently power your door lock. Since electric strikes require power in order for your door lock to work, a power trip would compromise on the accessibility and security for your space. As such, electric strikes can be designed in such a way that would either prevent the door from being locked electronically when power fails, or prevent an electronic unlock. A fail-secure electric strike allows a space to remain secured when the power fails (hence the name fail-secure). Such a lock requires power to be channeled to the strike before the keeper is allowed to pivot. As such, the only way to open the door during a power trip is doing it manually, like turning the door latch or using an old-school key. Most doors use a fail-secure setting on the strike since it requires no power to keep the door locked. A fail-safe strike has the opposite setting: it allows the keeper to pivot freely when there is NO power sent to the strike, which means that power has to be constantly fed to the door if you wish to keep it locked indefinitely. In sum: a fail-secure strike requires power to unlock the door, while a fail-safe strike requires power to keep it locked at all times. Some strikes are built-in with both settings; consult a locksmith on what type of settings you need on your strike before purchasing.